The Government is firmly on course to achieve high growth of 8% plus as manufacturing, services and exports are back on good growth path. While GDP growth at 6.3% in the second quarter of 2017-18 signaled turnaround of the economy, growth in the second half is likely to remain between 7.2% to 7.5%. 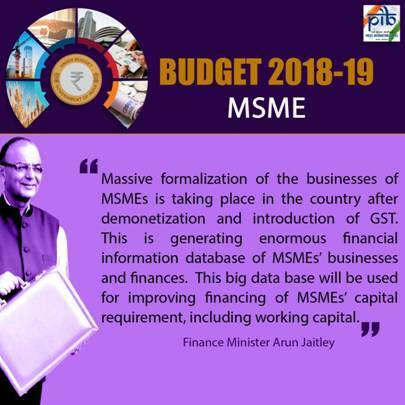 The Union Minister for Finance and Corporate Affairs Shri Arun Jaitley while presenting the General Budget 2018-19 in Parliament today said that Indian society, polity and economy had shown remarkable resilience in adjusting with the structural reforms. IMF, in its latest Update, has forecast that India will grow at 7.4% next year in the backdrop of services resuming high growth rates of 8% plus, exports expected to grow at 15% in 2017-18 and manufacturing back on good growth path. He said ,that government has decided to keep MSP for all unannounced kharif crops atleast one and half times of their production cost after declaring the same for the majority of rabi cops. He said,the volume of institutional credit for agriculture sector from year-to-year increased from Rs.8.5 lakh crore in 2014-15 to Rs.10 lakh crore in 2017-18 and he proposed to raise this to Rs.11 lakh crore for the year 2018-19. After the establishment of Dairy Infrastructure Fund, Shri Jaitley announced setting up a Fisheries and Aqua culture Infrastructure Development Fund (FAIDF) for fisheries sector and an Animal Husbandry Infrastructure Development Fund (AHIDF) for financing infrastructure requirement of animal husbandry sector with a total corpus of Rs.10,000 crore for the two new funds. On the lines of ‘‘Operation Flood’’ a new Scheme ‘‘Operation Greens’’ was announced with an outlay of Rs 500 Crore to address the challenge of price volatility of perishable commodities like tomato, onion and potato with the satisfaction of both the farmers and consumers. He also announced to develop and upgrade existing 22,000 rural haats into Gramin Agricultural Markets (GrAMs) to take care of the interests of more than 86% small and marginal farmers. These GrAMs, electronically linked to e-NAM and exempted from regulations of APMCs, will provide farmers facility to make direct sale to consumers and bulk purchasers. Moreover, an Agri-Market Infrastructure Fund with a corpus of Rs.2000 crore will be setup for developing and upgrading agricultural marketing infrastructure in the 22000 Grameen Agricultural Markets (GrAMs) and 585APMCs. He said, so far 470 APMCs have been connected to e-NAM network and rest will be connected by March, 2018. Shri Jaitley announced Rs 200 crore for organized cultivation of highly specialized medicinal and aromatic plants and said that the organic farming by Farmer Producer Organizations (FPOs) and Village Producers’ Organizations (VPOs) in large clusters, preferably of 1000 hectares each will be encouraged. Similarly, allocation of Ministry of Food Processing has been doubled from Rs.715 crore in 2017-18 to Rs.1400 crore in 2018-19. Terming Bamboo as ‘Green Gold’, the Finance Minister announced a Re-structured National Bamboo Mission with an outlay of Rs.1290 crore to promote bamboo sector in a holistic manner. Under Prime Minister Krishi Sinchai Yojna-Har Khet ko Pani, 96 deprived irrigation districts will be taken up with an allocation of Rs 2600 crore. The Centre will work with the state governments to facilitate farmers for installing solar water pumps to irrigate their fields. He also proposed to extend the facility of Kisan Credit Cards to fisheries and animal husbandry farmers to help them meet their working capital needs. 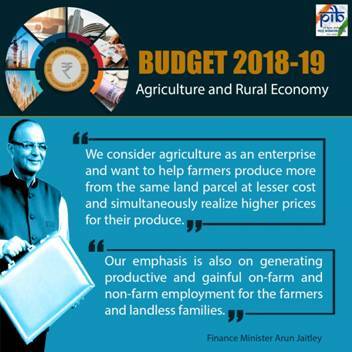 Shri Jaitley said India’s agri-exports potential is as high as US $100 billion against current exports of US $30 billion and to realize this potential, export of agri-commodities will be liberalized. He also proposed to set up state-of-the-art testing facilities in all the forty two Mega Food Parks. He also announced a special Scheme to support the efforts of the governments of Haryana, Punjab, Uttar Pradesh and the NCT of Delhi to address air pollution in the Delhi-NCR region by subsidizing machinery required for in-situ management of crop residue. On cleaning the Ganga, the Finance Minister said, a total of 187 projects have been sanctioned under the Namami Gange programme for infrastructure development, river surface cleaning, rural sanitation and other interventions at a cost of Rs.16,713 crore. 47 projects have been completed and remaining projects are at various stages of execution. All 4465 Ganga Grams – villages on the bank of river - have been declared open defecation free. He said, the government has identified 115 aspirational districts taking various indices of development in consideration for making them model districts of development. Emphasising that infrastructure is the growth driver of economy, the Finance Minister estimated that investment in excess of Rs.50 lakh crore is needed to increase growth of GDP and connect the nation with a network of roads, airports, railways, ports and inland waterways. 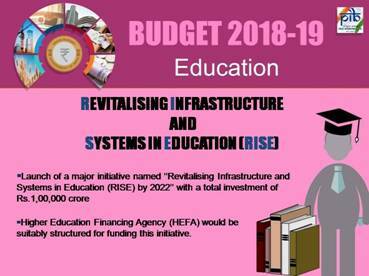 He announced increase of budgetary allocation on infrastructure for 2018-19 to Rs.5.97 lakh crore against estimated expenditure of Rs.4.94 lakh crore in 2017-18. The Government has made an all-time high allocation to rail and road sectors and is committed to further enhance public investment. The Prime Minister personally reviews the targets and achievements in infrastructure sectors on a regular basis. Using online monitoring system of PRAGATI alone, projects worth 9.46 lakh crore have been facilitated and fast tracked. Railways Capital Expenditure for the year 2018-19 has been pegged at Rs.1,48,528 crore. A large part of the Capex is devoted to capacity creation. 4000 kilometers of electrified railway network is slated for commissioning during 2017-18. Work on Eastern and Western dedicated Freight Corridors is in full swing. Adequate number of rolling stock – 12000 wagons, 5160 coaches and approximately 700 locomotives are being procured during 2018-19. Over 3600 kms of track renewal is targeted during the current fiscal. Redevelopment of 600 major railway stations is being taken up. Mumbai’s local train network will have 90 kilometers of double line tracks at a cost of over Rs.11,000 crore. 150 kilometers of additional suburban network is being planned at a cost of over Rs.40,000 crore, including elevated corridors on some sections. A suburban network of approximately 160 kilometers at an estimated cost of Rs.17,000 crore is being planned to cater to the growth of the Bengaluru metropolis. The Budget proposes to expand the airport capacity more than five times to handle a billion trips a year under a new initiative - NABH Nirman. Under the Regional connectivity scheme of UDAN (Ude Desh ka Aam Nagrik) initiated by the Government last year, 56 unserved airports and 31 unserved helipads would be connected. To encourage raising funds from bond market, the Finance Minister urged regulators to move from ‘AA’ to ‘A’ rating for investment eligibility. He said that the Government will establish a unified authority for regulating all financial services in International Finance Service Centre (IFSCs) in India. The Finance Minister said that NITI Aayog will initiate a national program to direct efforts in artificial intelligence. Department of Science & Technology will launch a Mission on Cyber Physical Systems to support establishment of centres of excellence for research, training and skilling in robotics, artificial intelligence, digital manufacturing, big data analysis, quantum communication and internet of things. 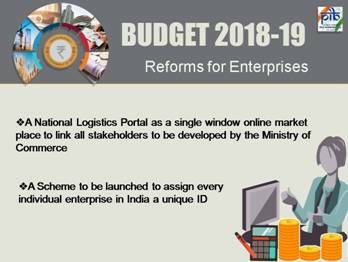 The Budget doubled the allocation on Digital India programme to Rs 3073 crore in 2018-19. To further Broadband access in villages, the Government proposes to set up five lakh wi-fi hotspots to provide net connectivity to five crore rural citizens. The Finance Minister allocated Rs. 10000 crore in 2018-19 for creation and augmentation of Telecom infrastructure. 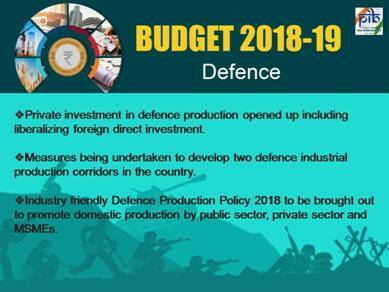 Recognizing the sacrifices made by the Armed Forces in meeting the security challenges, the Finance Minister proposed development of two defence industrial production corridors. Shi Jaitley announced that a scheme will be evolved to assign every individual enterprise in India a unique ID, on the lines of Aadhar. The Finance Minister announced that 2017-18 disinvestment target of Rs.72,500 crore has been exceeded and expected receipts of Rs.1,00,000 crore. He set disinvestment target of Rs.80,000 crore for 2018-19. Three Public Sector Insurance companies- National Insurance Co. Ltd., United India Assurance Co. Ltd., and Oriental India insurance Co. Ltd., will be merged into a single insurance entity. The Finance Minister announced that a comprehensive Gold Policy will be formulated to develop gold as an asset class. 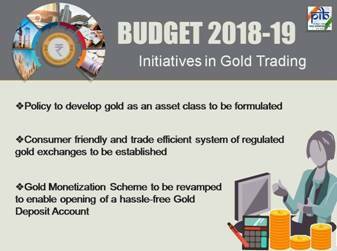 The Government will also establish a system of consumer friendly and trade efficient system of regulated gold exchanges in the country. Gold Monetization Scheme will be revamped to enable people to open a hassle-free Gold Deposit Account. With regard to the emoluments paid to the Members of Parliament, the Finance Minister proposed necessary changes to refix the salary and allowances with effect from April 1, 2018. He said the law will also provide for automatic revision of emoluments every five years indexed to inflation and hoped that the Hon’ble Members will welcome this initiative. To celebrate the 150 Birth Anniversary of Mahatma Gandhi, Father of the Nation from 2nd October 2019, the Budget set aside Rs.150 crore for the activities leading to the commemoration programme. 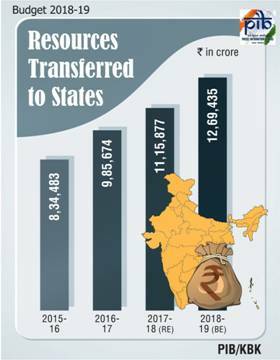 The Budget Revised Estimates for expenditure in 2017-18 are Rs.21.57 lakh crore (net of GST compensation transfers to the States) as against the Budget Estimates of Rs.21.47 lakh crore. 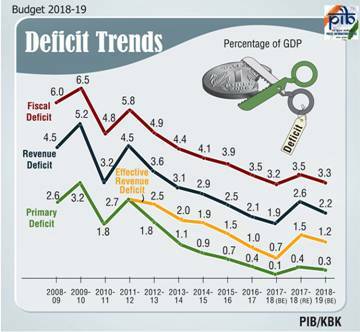 Continuing Government’s path of fiscal reduction and consolidation, the Finance Minister projected a Fiscal Deficit of 3.3% of GDP for the year 2018-19. 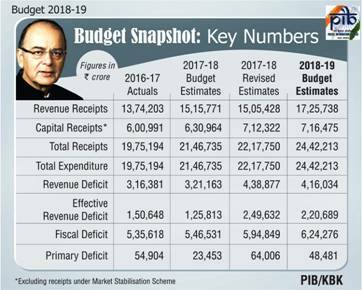 The Revised Fiscal Deficit estimates for 2017-18 were put at Rs. 5.95 lakh crore at 3.5% of GDP. He also proposed acceptance of key recommendations of the Fiscal Reform and Budget Management Committee to bring down Central Government’s Debt to GDP ratio to 40%. Presenting his direct tax proposals, the Finance Minister said that attempts to reduce the cash economy and increase the tax net have paid rich dividends. The growth rate of direct taxes in financial years 2016-17 and 2017-18 have been significant, he said. 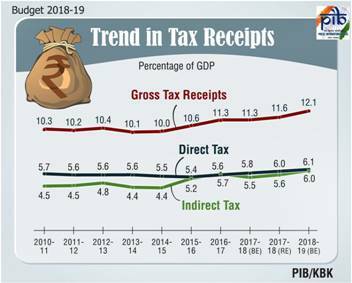 The growth of direct taxes in financial year 2016-17 was 12.6 percent, and for financial year 2017-18 (upto 15th January, 2018) is 18.7 percent. Therefore Shri Jaitley said buoyancy in personal income tax for financial year 2016-17 and 2017-18 (RE) are 1.95 and 2.11 respectively. This the Finance Minister said, indicates that additional revenue collected in the last two financial years from personal income tax compared to average buoyancy for the pre 2016-17 period, amounts to a total of Rs. 90,000 crore, which is a result of a strong anti-evasion measures by the government. The Finance Minister also said that there has been a huge increase in the number of returns filed by tax payers. The number of Effective Tax Payers has increased from 6.47 crore at the beginning of Financial year 2014-15 to 8.27 crore at the end of 2016-17. Shri Jaitley has proposed 100 percent deduction to companies registered as Farmer Producer Companies with an annual turnover upto Rs. 100 crore on profit derived from such activities, for a period of five years from financial year 2018-19. This he said will promote post harvest agriculture activities and also encourage “Operation Greens” announced earlier and would give a boost to the Sampada Yojana. In order to encourage creation of new employment the deduction of 30 percent Under Section 80-JJAA with a further relaxation to 150 days in the case of the apparel industry, has been proposed to be extended to the footwear and leather industry. The Finance Minister has also proposed to rationalise the deduction of 30 percent by allowing the benefit for a new employee employed for less than the minimum period during the first year, but continues to remain employed for the minimum period in the subsequent year. Turning to the real estate sector, the Finance Minister has proposed that no adjustment shall be made in respect of transactions in immovable property, where the Circle Rate value does not exceed 5 percent of the consideration. This would minimize hardship in real estate transactions. In fulfilment of the promise to reduce the corporate tax rate in a phased manner, Shri Jaitley has proposed to extend the reduced rate of 25 percent currently available for companies with turnover of less than 50 crore (in Financial Year 2015-16), also to companies reporting turnover up to Rs. 250 crore in Financial Year 2016-17. This would benefit the entire class of micro, small and medium enterprises, which account for almost 99 percent of companies filing tax returns, he said. The estimated revenue forgone during Financial Year 2018-19 will be Rs. 7,000 crore. This lower corporate income tax rate would leave such companies with higher investible surplus, which would create more jobs. The Budget proposals also seek to provide relief to salaried tax payers by allowing a Standard Deduction of Rs. 40,000 in place of the present exemption allowed for transport allowance and reimbursement of miscellaneous medical expenses. However, transport allowance at enhanced rate is proposed to be continued for differently abled persons. Further, it is also proposed to continue medical reimbursement benefits in case of hospitalization etc. for all employees. The proposed Standard Deduction will help middle class employees even further in reducing their tax liabilities. It will also significantly benefit pensioners, who normally do not enjoy any allowance for transport and medical expenses, Shri Jaitley said. 2.5 crore salaried employees and pensioners would benefit from this proposal and the revenue cost would be approximately Rs. 8,000 crore. Exemption of interest income on deposits with banks and post offices are proposed to be increased from Rs. 10,000 to Rs. 50,000. TDS shall not be required to be deducted under section 194A. Benefit will also be available for interest from all fixed deposit schemes and recurring deposit schemes. Increease in deduction limit for medical expenditure for certain critical illness from Rs. 60,000 (in case of senior citizens) and from Rs. 80,000 (in case of very senior citizens) to Rs. 1 lakh for all senior citizens, under section 80DDB. Concessions will give extra tax benefit of Rs. 4,000 crore to senior citizen. It is also proposed to extend the Pradhan Mantri Vaya Vandana Yojana up to March, 2020. The current investment limit is also proposed to be increased to Rs. 15 lakh from the existing limit of Rs. 7.5 lakh per senior citizen. It is proposed to provide more concessions for International Financial Services Centre (IFSC), in order to promote trade in stock exchanges located in IFSC. The concessions propose transfer of derivatives and certain securities by non- residents from capital gains tax, and non corporate tax payers operating in IFSC to be charged Alternate Minimum Tax (AMT) at concessional rate of 9 percent at par with Minimum Alternate Tax (MAT) applicable for corporates. In a measure that proposes to control the cash economy, payments exceeding Rs. 10,000 in cash made by trusts and institutions shall be disallowed and would be subject to tax. In order to improve TDS compliance by these entities, the Finance Minister has proposed to provide that in case of non deduction of tax, 30 percent of the amount shall be disallowed and would be taxed. Turning to rationalization of Long Term Capital Gains (LTCG), the Finance Minister noted buoyancy in the equity market, as a result of reforms and incentives given so far. The total amount of exempted capital gains from listed shares and units is around Rs. 3,67,000 crore (as per returns filed for A.Y. 2017-18). Shri Jaitley said that a major part of this gain has accrued to corporates and LLPs. This has also created a bias against manufacturing, leading to more business surpluses being invested in financial assets. Due to attractiveness on return on investment on equity, even without tax exemption, there is a strong case for bringing Long Term Capital Gains from listed equities in the tax net, the Finance Minister said. He has however only proposed a modest change in the present regime, recognizing that a vibrant equity market is essential for economic growth. Shri Jaitley has proposed to tax such Long Term Capital Gains exceeding Rs. 1 lakh at the rate of 10 percent, without allowing any indexation benefit. However, all gains up to 31stJanuary, 2018 will be grandfathered. The Finance Minister has also proposed to introduce a tax on distributed income by equity oriented mutual funds at the rate of 10 percent, to provide a level field across growth oriented funds and dividend distributing funds. The proposed change in Capital Gains Tax will bring marginal revenue gain of about Rs. 20,000 crore in the first year, in view of grandfathering. 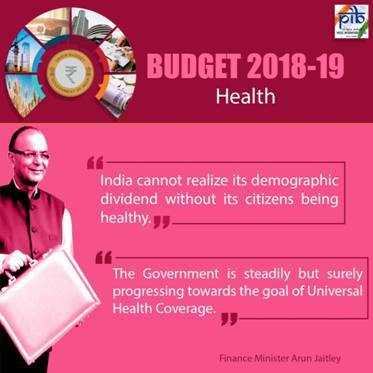 In order to take care of the education and health care needs of Below Poverty Line (BPL) and rural families, The Budget proposes to increase the cess on personal income tax and corporation tax to 4 percent from the present 3 percent. The new cess will be called the “Health and Education Cess” and is expected to lead to a collection of an estimated additional amount of Rs. 11,000 crore. 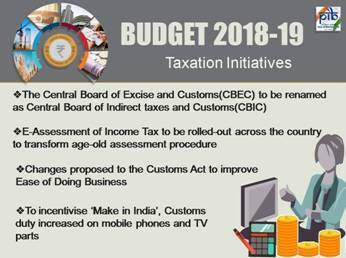 On the indirect taxes side, this being the first budget after the roll out of the Goods and Services Tax (GST), the budget proposals are mainly on the customs side. The Finance Minister has proposed changes in customs duty to promote creation of more jobs in the country and also to incentivise domestic value addition and Make in India in sectors such as food processing, electronics, auto components, footwear and furniture. Therefore it is proposed to increase customs duty on mobile phones from 15 percent to 20 percent, on some of their parts and accessories to 15 percent and on certain parts of televisions to 15 percent. Customs duty is proposed to be reduced on raw cashew from 5 percent to 2.5 percent, to help the cashew processing industry. It is also proposed to abolish the Education Cess and Secondary and Higher Education Cess on imported goods. In its place it is proposed to impose a Social Welfare Surcharge at the rate of 10 percent of the aggregate duties of Customs, on imported goods, to provide for social welfare schemes of the government. However, goods which were so far exempt from Education Cesses on imported goods, will however continue to be so. In addition, certain specified goods, mentioned in Annexure 6 of the Budget speech, will attract the proposed Surcharge, at the rate of 3 percent of the aggregate duties of customs only. With the roll of GST, the Budget also proposes to change the name of the Central Board of Excise and Customs (CBEC) to the Central Board of Indirect Taxes and Customs (CBIC).